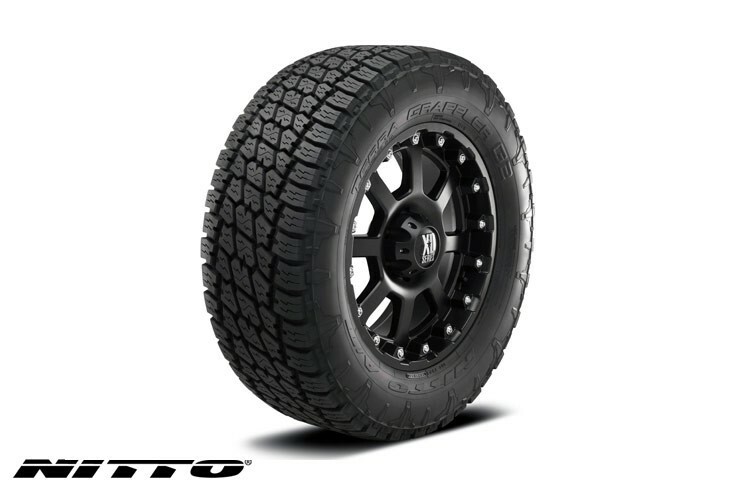 The Terra Grappler G2 is Nitto’s next generation all-terrain light truck tire specifically designed to meet your everyday on and off-road adventures. Whether you’re commuting to work, towing a trailer or headed up to your favorite mountain trail; the balanced off-road and on-road performance of the Terra Grappler G2 will get you to your destination. Coupling joints connect the outer most tread blocks to the center blocks, increasing the block edge rigidity. Full depth siping helps maintain tread design appearance as the tire wears. New sidewall designs connects the sidewall lugs from the shoulder block down to the middle of the sidewall surface. Computer analyzed tread block arrangement reduces tire noise at highway driving speeds. Features two distinct and bold sidewall designs so you can pick which one faces the road. One side features an homage to the original Terra Grappler with a raised thunderbolt pattern for an aggressive look. The other side features a new aggressive "blade" design which features integrated sidewall lugs that run all the way from the shoulder tread block to the sidewall.